It is reported to be an effective insect repellent which is suitable for humans and animals to keep annoying insects at a distance. It can also be added to enhance shampoos, conditioners, skin lotions and pet care. Traditional Uses: In Japan, Hinoki is the preferred wood for building palaces, temples, shrines and bath houses. It is the wood from which the Emperors palaces and casket were made. It is Japans most prized wood. True Hinoki is a cypress that grows only in Japan; it is a lemon scented, light coloured wood with a rich, straight grain which is highly resistant to rotting. Description: It is reported to be an effective insect repellant which is suitable for humans and animals to keep annoying insects at a distance. It can also be added to enhance shampoos, conditioners, skin lotions and pet care. Blends well with: Lavender, Neroli, Geranium, Cinnamon, Patchouli, Palmarosa, Neroli and Sweet Orange. 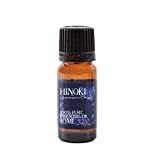 Traditional Uses: In Japan, Hinoki is the preferred wood for building palaces, temples, shrines and bath houses. It is the wood from which the Emperorals palaces and casket were made. It is Japans most prized wood. True Hinoki is a cypress that grows only in Japan; it is a lemon scented, light colored wood with a rich, straight grain which is highly resistant to rotting.